Our cheese cases are filled with a delicious assortment of Vermont cheeses, most cut to order. 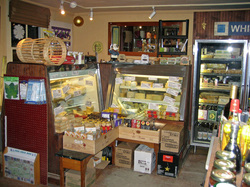 We also stock traditional imported cheeses such as Parmigiano Reggiano, Manchego, Stilton, and more. In addition to a wonderful cheese selection, you will find other essential items to complement any cheese platter: salami, saucisson, pepperoni, olives, cornichons, fruit spreads, crackers, oh my!! !